Jonathan Blow says that PSN and XBLA both have their merits for indie games, even if some people want to make it seem like he thinks otherwise. 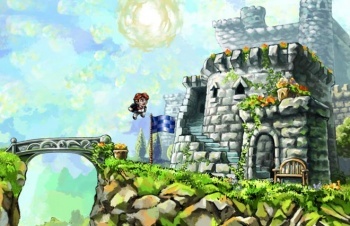 Blow, the auteur developer behind 2008 hit time-manipulation platformer, Braid, claims that Sony has a much more experimental attitude towards indie games, and is much less risk averse than Microsoft. He said that while the bar for getting games on to Live Arcade was lower, most of them weren't very good. Sony was more deliberate about what games it allowed on PSN, but Blow thought that it was much more willing to release experimental or artful games like Linger in Shadows - a "demoscene" project that is more like an piece of interactive artwork than it is a traditional game. Blow thought that although there were the occasional flashes of brilliance on Live Arcade, such as the recent Super Meat Boy, the service was ultimately a bureaucratic machine, which in turn was part of another, larger bureaucratic machine, so was not well designed to promote anything experimental. He said that while indie games were fewer in number on PSN, they had more impact on gaming as a whole. While Blow may have a point that PSN has more high-profile "artistic" titles on PSN than Microsoft does on Xbox Live, you can't ignore the fact that Microsoft has a dedicated channel for the smaller indie developers. You might make the case that the XBLIG is exactly what Blow meant when he referred to the low bar to entry and low overall quality, but the games those developers produce are just as worthy of consideration as something like Blow's own Braid. UPDATE: In a post on the development blog for his upcoming game, The Witness, Blow said that his comments about PSN and XBLA had been taken out of context. He said that in the full interview with Edge, how Microsoft and Sony handle their respective indie game catalogues was only a small part portion of what he and Chris Hecker talked about. The whole interview was much broader in scope than the snippet presented above, and included points about the various types of indie game, such as the aforementioned work produced by the XBLIG community, and how long indie games will be able to find that kind of audience that Braid did. Blow said that to pull quotes like that from the interview and present them out of context was not only sensationalist and less than worthless, it actually damaged the relationship that Blow and his team had with Microsoft and Sony.